The LA Weekly has a fun piece about “Case # 2:06-bk-11205-VZ,” the bankruptcy auction of Death Row Records’ property. This collection of detritus from the former headquarters of the West Coast gangsta rap movement was ordered sold by the US Bankruptcy court in the aftermath of Suge Knight’s financial default. Promotional CD’s, Posters, Stickers, Flat’s Etc. Officially dubbed “Case # 2:06-bk-11205-VZ,” the day’s festivities were ordered up by the US Bankruptcy Court on behalf of Suge Knight and Death Row Records. As the staple of Los Angeles music and definition of gangster rap for nearly a decade since its 1991 inception, the controversial record label and its fearsome owner ran their pop culture course into the ground shortly after its flagship star, Tupac Shakur, was gunned down in Las Vegas in 1996. But for nearly 200 bidders at the auction, the spirit of Death Row was still relevant in 2009. The specifics of that relevancy remained varied. For some, it was a chance to make a quick buck. Where else could you buy 17,000 CD copies of Snoop Dogg’s Tha Doggfather for four cents a piece? Others were looking for deals…like a pallet full of dated (but working) television sets that sold for $15. And in accord with many of Death Row’s notorious business practices, some people were just trying to get their stuff back. Before the auction began, bidders carefully eyed each other. It was easy to imagine Snoop or Dre sending surrogates for their platinum plaques and VMAs, or even that Suge commissioned troops to make sure certain things stayed unsold. But when the auctioneer commenced the dizzying affair with cases of “Death Row Water” — for less than the cost of water, to people who clearly had never attended an auction before in their life — it was apparent that the majority of the day’s bidders were there for one thing: Nostalgia. But the same guy that snagged my beloved Nate Dogg portrait also won everything else he attempted, including two of the day’s biggest prizes: the “Notorious P.I.G.” original painting and Death Row’s actual electric chair. His name was Dale and his tattoos spoke louder than he did, explaining that he was a fan of “big businessmen like Suge” and that, yeah, he did have a few good spots to put all this artwork. Dale’s seemingly bottomless wallet may have left a few fellow bidders bitter — he’d just hold his arm in the air until everyone else bowed out — but if bullying wasn’t the mantra of Death Row, then nothing was. 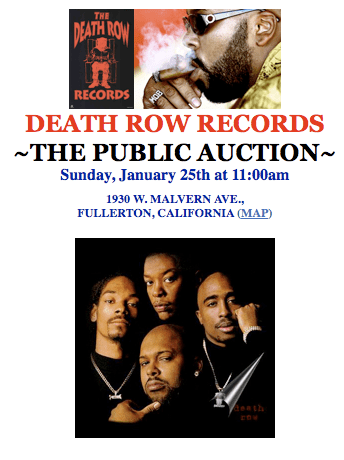 Check out a slideshow of images from the Death Row auction here.